Plays on planet Gateway (limit one). Once per turn, one or more personnel present may time travel to a time location in this quadrant, or may return here from there (with any of owner's other personnel present). 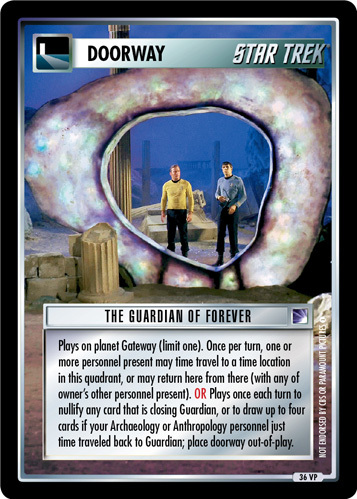 OR Plays once each turn to nullify any card that is closing Guardian, or to draw up to four cards if your Archaeology or Anthropology personnel just time traveled back to Guardian; place doorway out-of-play. Image Source: The Original Series: "The City on the Edge of Forever"